Ethiopia can share its recent experience of ending a 20-year border war with longtime foe Eritrea to encourage South Korea’s initiative to create a peace regime on the Korean Peninsula. The border between Ethiopia and Eritrea reopened in September last year following a peace agreement that put an end to what once seemed an irresolvable conflict, having led to war from 1998 to 2000. “It has been only few months since the signing of the peace agreement with Eritrea, but its impacts are huge,” Shiferaw Shigutie, Ethiopian ambassador to South Korea, said in an interview with The Korea Herald at his office in Seoul on March 14. People-to-people exchanges have already started since Ethiopia’s Prime Minister Abiy Ahmed and Eritrean President Isaias Afwerki inked the treaty, and troops have been pulled out from the disputed territories. “He (the Ethiopian prime minister) has achieved regional peace and is rigorously working on regional economic integration,” the top envoy said. Since the premier came to power in April last year, massive economic and political reform is underway in keeping with his vision of turning the country into a continental economic heavyweight, the ambassador added. The country has experienced fast economic growth in the last decade, averaging about 10 percent a year, propelled by manufacturing and tourism. To bring its economy to the next stage, he said, it has been focusing on modernizing its agricultural sector and growing export-oriented light manufacturing with a “competitive young labor force,” Shiferaw said. To give an impetus to the government’s initiatives, Shiferaw said he would work closely with business communities, especially those that want expand their business beyond South Korea. “It is believed that attracting investment from South Korea will be beneficial for both countries. Korean investors can enjoy a trainable young labor force at competitive wage rate and Ethiopia’s strategic location for export of their products,” he said. 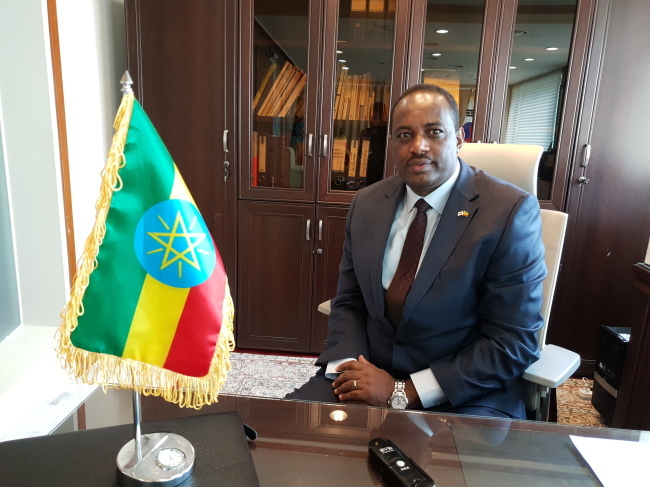 His mission as the new Ethiopian ambassador to South Korea also includes expanding scholarship programs for Ethiopian students who wish to study here. “Studying in Korea does not only mean that they will get knowledge in their field of study but also means that they will learn the Korean experience in economic development and democratization,” he said. So far, some 400 students have been granted scholarships from the South Korean government.